The two races in the Suzuki Asian Challenge that were a part of the fourth round of the 2016 Asia Road Racing Championship were action packed. Local hero Jefri Tosema took pole position at the track. The first race began with the riders from the front row - Tosema and his team-mate Muhammad Sapril - leading a pack of nine riders around the field. It was a closely fought race, with exciting lead changes all through the race. However, it wasn't possible for any of the other riders to beat Tosema, and he won the race comfortably. 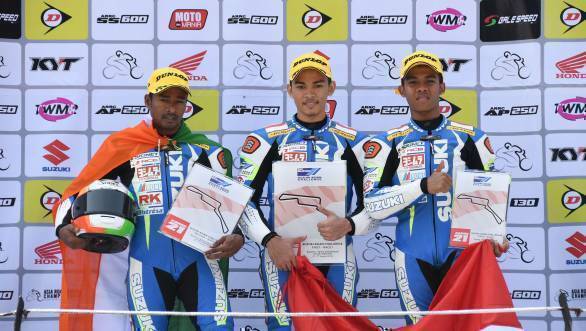 Second place went to Indian rider Jagan Kumar, who had won the Suzuki Asian Challenge race here in 2015. Third place went to Rizal Feriyadi of Indonesia. The second race saw Rozaliman Zakaria win, with Tosema second and April King Mascardo third.